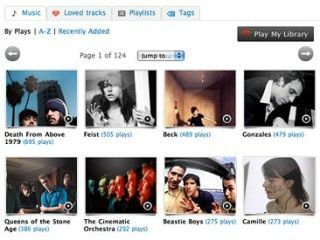 Last.fm has just upgraded its socially networked music service with a new multimedia Personalized Visual Music Player that mixes genres and adds photos, videos and video advertising. The new player has a video window that shows cover art, artist photos or promo videos, alongside music recommendations, events, user comments and now "unique visual branding opportunities", too. Last.fm's 'radio stations' can now be generated using multiple (up to three) artists, so if you've ever wondered what a Lady GaGa and Glen Miller mash-up would sound like, here's your chance to find out. You can also select several genres of music to create a unique station, and the player comes with the usual 'love', 'ban' and 'skip' buttons. Last.fm now has a library of over 45 million tracks from over 280,000 artists and labels, and plays over a billion tracks a month. Martin Stiksel, Last.fm Co-Founder, said, "Personalized Visual Music shows what's possible with Last.fm's unparalleled music database and the innovative vision of our team. The bold new music player allows brands and sponsors the opportunity to directly reach these users in a visually exciting way." After a quick trial, most of video content seems to be Ken Burns-style zooming and panning of artist photos. It also appears as if the previous audio ads have been ditched in favour of the video commercials - making for a less jarring listening experience.